Heading into the final months of his term, Snyder has made progress on key proposals related to talent, education spending and infrastructure, though some challenges remain. In January, following Michigan Gov. 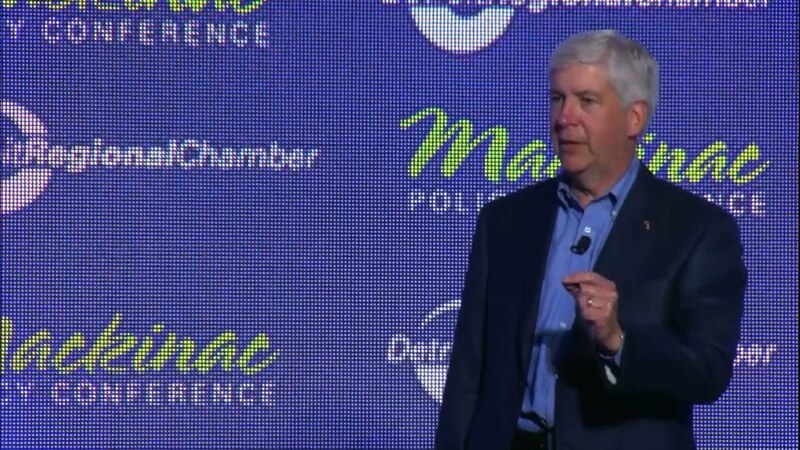 Rick Snyder’s final State of the State address, Bridge Magazine analyzed five of his goals in what was an ambitious agenda during his last year in office. Political and business leaders told Bridge they were skeptical about what Snyder could accomplish as a term-limited leader — “iffy,” said the headline. Seven months later, as the Legislature gears up for its fall session, Snyder has largely made good on his last-year ambitions before he leaves office in January. In his January speech, the governor vowed to make the largest investment in public schools in more than a decade, set aside more money to fix Michigan’s crumbling roads and roll out a major talent initiative designed to fill job openings in high-demand fields. It was a heady to-do list. Related: Five big things Michigan Gov. Rick Snyder wants done. All of them iffy. But he was also a lame-duck governor in an election year when every statewide office and all 148 House and Senate seats were being contested, not exactly a recipe for legislative action, even with Lansing Republicans firmly in charge. Likewise, the state’s conservative Legislature had not shown an appetite to raise taxes or spend more state dollars despite failing roads and public schools that lag most other states. Given the realities of term limits and that Snyder is in the final year of his term, "he’s done very well. At that point, you’re just trying to keep the ship running," said John Truscott, CEO of Lansing-based public relations firm Truscott Rossman, who was among the business leaders who spoke to Bridge in January. “I think it comes down to leadership," Truscott said of Snyder. "He’s told people what he’s wanted to do, he’s set the example and gotten people through it." Here’s where Snyder’s agenda stands heading into the final months of his term. Snyder’s proposal: The largest increase in per-student school funding in 15 years. Michigan’s base, per-student funding level in the fiscal year that starts Oct. 1 will be more than $7,800 per student, though K-12 public school districts receive varying amounts across the state. The school budget Snyder signed this summer will give $120 more in per-student aid to K-12 public school districts that receive the most state funding — more than $8,400 — and $240 more per student to schools that receive the base amount. That so-called “2x” funding formula has helped reduce the gap between the richest and poorest school districts in Michigan to its lowest point in years. It’s the highest single-year increase since at least the 2002 fiscal year, when per-student state aid increased by $500 for the lowest-funded districts, according to the Senate Fiscal Agency. Even so, critics say a continuing disparity in how Michigan’s public schools are funded creates educational inequity based on where students live. A collaborative of education and business leaders released a study this year that says Michigan needs to spend thousands more per student than it does based on the cost of educating its most vulnerable students, including students living in poverty and those without a strong command of the English language. Districts also should receive extra funding to educate students with disabilities, according to the report. Snyder’s proposal: More money in the 2019 budget for roads. The budget adopted for the 2019 fiscal year that starts Oct. 1 includes roughly $300 million in one-time surplus revenue for roads. It also includes more than $600 million in new revenue from increased gasoline taxes and registration fees, as well as $150 million in diverted income tax revenue to roads. Both of those were outlined in a $1.2 billion road-funding package Snyder signed into law in 2015 after a tax increase ballot proposal overwhelmingly failed among statewide voters. The road-funding package gets half of its funding from new revenue in increases to the state’s gasoline tax and vehicle registration fees. The remaining half will be diverted to roads from the roughly $10 billion general fund by 2021. So Snyder fulfilled this pledge as well, though the increase remains below what a Snyder-appointed commission identified is needed annually for Michigan’s infrastructure. The 21st Century Infrastructure Commission in 2016 estimated that Michigan needs to spend as much as $4 billion more per year over 20 years to maintain the state’s existing roads, water systems and other infrastructure needs, and about $2.6 billion more per year just on roads, bridges and transportation. Snyder’s proposal: A major talent initiative that seeks to better prepare Michigan workers for higher-paying, 21st-Century careers. Snyder in February outlined the framework of his talent initiative, dubbed the “Marshall Plan for Talent” after a program to rebuild Europe after World War II. He signed the $100 million initiative in June. The initiative was backed by school districts and business groups such as Talent 2025 and the Michigan Manufacturers Association. Snyder has made expanding Michigan’s talent pipeline a hallmark of his administration. The state’s unemployment rate (unadjusted for seasonal fluctuation in employment) was down to 4.3 percent in June, the most recent state data available, and employers — especially companies in the skilled trades — are concerned that they don’t have enough younger workers to replace those nearing retirement. The talent plan was pitched as a way to help fill more than 800,000 jobs in such fields as information technology, health sciences and manufacturing that Snyder’s administration said are expected to open by 2024. The plan includes funding for “career navigators” who would work with students on career preparation; scholarships and stipends for students to earn credentials in particular fields; incentives for teachers who take jobs in high-demand subjects, like career-technical education, which has seen a shortage of applicants across the state; and other tools to connect students with real-world career experience. Snyder’s proposal: Protecting the Great Lakes from invasive species, including Asian carp. It’s too early to say how much success Snyder’s Asian carp-blocking efforts will yield. Snyder has also negotiated with neighboring states to fund a $275 million draft plan to install carp-blocking barriers at Brandon Road Lock and Dam on the Des Plaines River near Joliet, Ill. Illinois entered those discussions in May, which Snyder's office has called a success. But Illinois, which has expressed concerns that new barriers would slow down cargo shipping, wants changes to the draft plan. It's unclear whether Illinois’ entry will bolster or muddle negotiations. Fueled by a voracious appetite, bighead and silver carp can grow to 100 pounds. Scientists fear an infiltration would wreak havoc on the Great Lakes food chain and devastate fisheries. At the time of his State of the State address, Snyder called out Washington for dragging its feet in helping the region. Since then, Snyder’s administration has been grappling with other environmental threats, most notably a group of hazardous chemicals known as PFAS — perfluoroalkyl and polyfluoroalkyl substances — commonly used in manufacturing to create nonstick and waterproofing substances. Michigan’s PFAS response is ongoing. Snyder’s proposal: Preserving his legacy of fiscal responsibility. Snyder’s budget includes another $115 million for Michigan’s rainy-day fund, which is expected to bring the state’s reserves to more than $1 billion in the upcoming fiscal year. When Snyder took office in 2011, Michigan’s reserves were about $2 million. Snyder, an accountant, has spent his two terms working to improve the state’s balance sheet. Aside from saving money in reserves, he has urged lawmakers to finish budgets in June — despite the fact that the state’s fiscal year doesn’t start until October — because many school districts and cities start their fiscal years in July. All eight of Snyder’s budgets have been adopted early. His administration said it also will pay down more than $1 billion to the state’s public school retirement system, with the goal of paying off Michigan’s pension debt by 2038, Snyder spokeswoman Anna Heaton told Bridge. Legislation signed into law last year that aims to help local governments manage their retiree pension and health care obligations has been criticized by some Republican lawmakers for not going far enough to allow the state to intervene in the event of a funding problem. And some fiscal reforms business groups have called for, such as writing into state law the practice of multi-year budgeting and requiring fiscal notes that spell out the cost of a bill before lawmakers pass it, have not been adopted by the Legislature. Heaton told Bridge that regardless of whether the practice is codified in statute, multi-year budgeting and finishing budgets well before the start of the new fiscal year have changed the state’s culture. But the year isn’t over, and the GOP-majority Legislature may yet vote to roll back the state’s income tax rate, which could impact state revenues. Former Gov. Jennifer Granholm raised it from 3.9 percent to 4.35 percent during her tenure. The higher rate, expected to be temporary, instead was frozen by Snyder at 4.25 percent early in his administration. Snyder has urged legislators throughout this term to avoid the short-term temptation of an income tax cut, given other fiscal pressures in the state general fund budget. The House failed to pass an income tax cut in February 2017, though the bill could be reconsidered before the two-year legislative session ends this December. Gideon D’Assandro, spokesman for House Speaker Tom Leonard, said Leonard remains supportive of rolling back the income tax rate, though it remains uncertain whether there would be enough support from House lawmakers at the end of the term to pass it. "So much depends upon the election," said Charles Ballard, an economist at Michigan State University. “I’m sure it will come to mind for some of the Republicans if they lose the governor’s race and/or lose control of one or more chambers of the Legislature." Bridge reporters Jim Malewitz and Mike Wilkinson contributed to this report. It takes a non politician to properly run government. Thank you Gov. Snyder for your 8 years of service. Tell that to the people he poisoned and the cars he ruined. Not to mention the tax he threw on old people. This is what responsible conservative leadership looks like. As to the "tax hike on old people", he actually made it fair. If you have a 401k or IRA, you always paid State income tax. If you were a union member with a pension, or a small business owner with a sharp accountant who set up a pension for you, you paid no income tax. How was that ever fair? People have gotten drinking water from the Flint river, often through lead pipes, for 150 years most of that without today's treatments. It obviously affected people like Durant so negatively that he could not found a company like GM. Oh, wait, he came out ok. Granholm started the process, Snyder could have done better, but there are lots of irresponsible politicians in both Flint and Lansing who's bad decisions created the whole mess to begin with who should bear blame as well. Snyder is just enough of a grown up to fix it and move on. Only a business man would poison thousands to save a million dollars. Some of the children are irreparably harmed for life. Take money away from schools then pat yourself on the back when you give some back. Give businesses tax breaks then pass the cost on to retirees by taxing pensions. Snyder is a politician in sheep's clothing. This is just wrong. As soon as Snyder understood the Flint water problem he moved to fix it. Coming up with the money to switch the water supply back to Detroit in September of 2015, addressing medical coverage, nutrition, monitoring and behavioral assessment, great start and early on education, and a host of other things related to mitigating any negative impact from lead ingestion. That is what a responsible leader does is recognize a problem and mobilize resources to fix it versus pointing fingers of blame. I am shocked at how few people actually do their homework to separate fact from fiction and you are among the laziest of misinformers. I guess if someone breaks into my house and steals my TV, then 8 years later brings back the clicker, without batteries, we would say that he "repaired my television set." Snyder robbed the schools of $1 billion, and worked to not pay back teachers millions he stole from their pensions for years, and is now being graded on a pretty awesome curve here as "meeting a campaign promise." You are delusional. Blind partisanship is just another form of racism. The k-12 budget is $2 billion higher than in 2010 and pre kindergarten programs have been increased by $130 million annually. The unfunded liabilities for teacher pensions has been cut by nearly a third. Without funding, where do those teachers think the money will come from when they retire? There are about 44,000 employees in state government. City, state, federal, and even county health department admitted mistakes were made in Flint water treatment. To lay the blame on Snyder is just partisan silliness. Additionally he secured 4 million extra for Flint before the water switch in 2014 to open the shuttered lockup and give Flint the ability to reduce outstanding arrest warrants from about 7200 to less than a thousand. Snyder didn't do it for votes because there were none to be had in Flint. He did it to get the bad actors off the street. Seriously dude, before spouting pure nonsense why don't you check the facts? And about your TV? Generous Motors stole it in the 1980s when they shuttered so much of their Flint operations the tax base due to GM dropped from 63% to 8%. Guys like you will never get it because intellectual honesty deserted you years ago along with GM. Have a good life. Interesting how Snyder, one of the least partisan, technocratic, financially responsible Governors Mi has had in the 40 years who by any reasonable measure took a state absolutely repellent to business, to a top tier economy and destination draws such hatred. Do any of you believe that Snyder will have his bags packed and loaded moving van with directions to California waiting outside the governor's mansion on his last day in office, like the last failed clown to occupy that office? Please let me know and we'll set up this wager. Snyder was governor during this Flint water fiasco, but he certainly wasn't directly responsible. Had those directly responsible for water treatment done their job properly, it wouldn't have been an issue. It's ignorant to place blame on Snyder. He really has done a good job for our state.